With plenty of small, family-run farms offering produce, meat and dairy, Marylanders and guests alike can enjoy the freshest of goods at a local farmers market. You find fresh farms just an hour outside of our major cities, so they aren’t difficult to get to. Here are some of our favorite markets in the state. This market is open on Sundays and an excellent spot to pick up fresh fruits and vegetables. The selection is excellent, food is farm-fresh, and there are also other vendors, making this a fun destination in general. You can find everything here from your fresh produce to seafood and tasty treats to eat while shopping. It’s like visiting a carnival and farmers market in one since you can even find some of your deep-fried favorites. This is also a favorite spot for local artists so you can pick up one of a kind pieces of blown glass, jewelry, pottery and more. Beautiful flower arrangements can be bought here while you also shop for delicious baked goods, fresh fruit and veggies, meat from the farm, and handcrafted treats. Open every weekend, it’s easy to access and tons of fun. Walking distance from everything, the Bethesda Central Farm Market is dog-friendly. They have meat straight from the farm in addition to the standard fruits and vegetable selection. It is open on Sundays and food trucks will also park here so you can eat lunch and shop at the same time. For more than food, head to the Olney Farmers and Artists Market where you can find handcrafted items, clothing, art, and fresh fruits and veggies to take home. They also have a meat store with an excellent selection and sometimes there is live music. Just be aware that it isn’t particularly dog-friendly. Sometimes it’s nice to visit a family-run farm stand. It makes you feel like you are buying food the way it was meant to be bought – straight from the farmer and on their land. One of the best things about this farm market is the prices. They are more affordable than buying organic in the store and less expensive than many of the popular farmer’s markets. Still, you can’t beat this level of freshness. Driving across the Bay Bridge is part of the adventure when visiting the farmers market in Stevensville. It’s beautiful on this side of the Bay, plus this is farm and Amish country. You can purchase all the fresh food and treats you like and then take a walk at a nearby beach park when you’re done. A perfect outing in the summer, head here for fun and wacky art while also buying fresh produce for the week. You can find spectacularly fresh food like granola to enjoy in the mornings. Unique finds, great food, and a quirky atmosphere make this farmers market stand out. This list would be incomplete without inviting you to head into Calvert County. There are many family-owned and operated farms here that have farm stands throughout the year. While not traditional farmers markets, you can find things like fresh made ice cream from the cows grazing the field, meat that was butchered in the last day or two and produce picked from the fields you just drove by. It’s a very organic experience to drive through the county and stop at farms along the way. It’s Amish Country! What can you expect other than fresh, delicious and homemade? Since everything is fresh, you can purchase food to take home or you can dine here and enjoy one of their premade meals. Buying your weekly fruits and veggies, makes this a grocery run combined with the best lunch spot around. Just be sure to purchase a pie or other baked good to take home – yum. 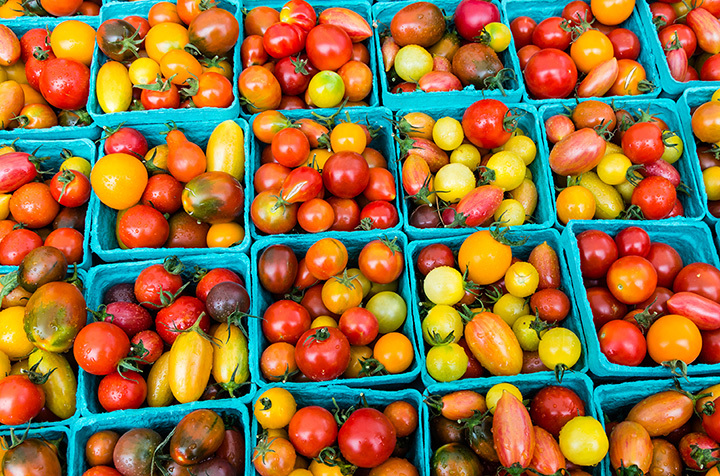 Farmer’s markets are full of tasty treats and food that taste like it should – fresh. Any of these markets will yield what you are looking for so pick one close to home or head out for a day of exploring and sampling. View more Maryland Farmers Markets.